We provide pdf’s of our publications with the understanding that only one copy will be downloaded per person, and only for personal, academic non-for profit pursuit. Lab members are highlighted in bold. 2. Oliver ECJ, Wernberg T, Benthuysen J, Chen K (eds) (2019) Advances in Understanding Marine Heatwaves and Their Impacts. Research Topic. Frontiers in Marine Science. In progress. 1. Wernberg T, Mieszkowska N, Kendrick GA, Hawkins SJ (eds) (2016) Tenth International Temperate Reefs Symposium. Special Issue. Marine and Freshwater Research, 16(1). [link]. 143. Holbrook NJ, Scannell HA, Sen Gupta A, Benthuysen JA, Feng M, Oliver EJC, Alexander LV, Burrows MT, Donat MG, Hobday AJ, Moore PJ, Perkins SE, Smale DA, Straub SC, Wernberg T (2019) A global assessment of marine heatwaves and their drivers. Nature Communications, accepted 2 March 2019. 142. Bennett S, Duarte CM, Marba N, Wernberg T (2019) Integrating within-species variation in thermal physiology into climate change ecology. Philosophical Transactions of the Royal Society B, accepted 20 February 2019. 140. Wernberg T, Filbee-Dexter K (2019) Missing the marine forests for the trees. Marine Ecology Progress Series, 612: 209-215. [doi.org/10.3354/meps12867] [pdf]. 139. Fulton C, Abesamis R, Berkström C, Depczynski M, Graham N, Holmes T, Kulbicki M, Noble M, Radford B, Tano S, Tinkler P, Wernberg T, Wilson S (2019) Form and function of tropical macroalgal reefs in the Anthropocene. Functional Ecology, accepted 3. January 2019. [doi: 10.1111/1365-2435.13282]. 138. Smale DA*, Wernberg T*, Oliver EJC, Thomsen MS, Harvey BP, Straub SC, Burrows MT, Alexander LV, Benthuysen JA, Donat MG, Feng M, Hobday AJ, Holbrook NJ, Perkins-Kirkpatrick SE, Scannell HA, Gupta AS, Payne B, Moore PJ (2019) Marine heatwaves threaten global biodiversity and the provision of ecosystem services. Nature Climate Change, accepted 18 December 2018. *Shared lead authorship. 137. 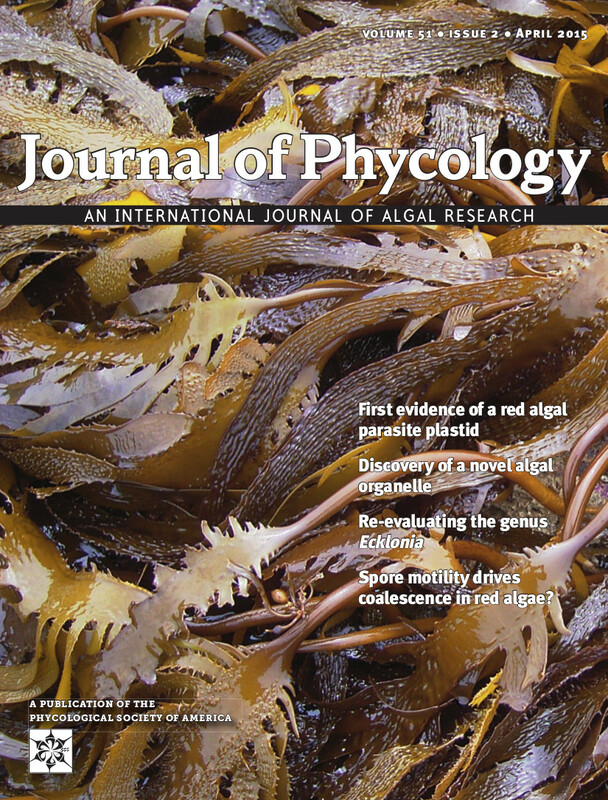 Wernberg T*, Coleman MA*, Babcock RC, Bell SY, Bolton JJ, Connell SD, Hurd CL, Johnson CR, Marzinelli EM, Shears NT, Steinberg PD, Thomsen MS, Vanderklift MA, Vergés A, Wright JT (2019) Biology and ecology of the globally significant kelp Ecklonia radiata. Oceanography and Marine Biology: An Annual Review, accepted 6 December 2018. *Shared lead authorship. 135. van Hees DH, Olsen YS, Mattio L, Ruiz-Montoya L, Wernberg T, Kendrick GA (2018) Cast adrift: physiology and dispersal of benthic Sargassum spinuligerum in surface rafts. Limnology & Oceanography, accepted 7/9/18. 133. Hobday AJ, Oliver ECJ, Gupta AS, Benthuysen JA, Burrows MT, Donat MG, Holbrook NJ, Moore PJ, Thomsen MS, Wernberg T, Smale DA (2018) Categorizing and Naming Marine Heatwaves. Oceanography, 31(2), 162–173. [doi.org/10.5670/oceanog.2018.205] [pdf]. 131. Ruthrof K, Breshears D, Fontaine J, Froend R, Matusick G, Kala J, Miller B, Mitchell P, Wilson S, van Keulen M, Enright N, Law D, Wernberg T, Hardy G (2018) Subcontinental heat wave triggers terrestrial and marine, multi-taxa responses. Scientific Reports, 8: 13094. [doi: 10.1038/s41598-018-31236-5] [pdf]. 130. Harris R, Beaumont L, Vance T, Tozer C, Remenyi T, Perkins-Kirkpatrick S, Mitchell P, Nicotra A, McGregor S, Andrew N, Letnic M, Kearney M, Wernberg T, Hutley L, Chambers L, Fletcher M-S, Keatley M, Woodward C, Williamson G, Duke N, Bowman D (2018) Biological responses to the ‘press’ and ‘pulse’ of climate trends and extreme events. Nature Climate Change, 8: 579-587. [doi: 10.1038/s41558-018-0187-9] [pdf]. 129. Coleman MA, Wernberg T (2018) Genetic and morphological diversity in sympatric kelps with contrasting reproductive strategies. Aquatic Biology, 27: 65–73. [doi.org/10.3354/ab00698] [pdf]. 128. de Bettignies T, Wernberg T, Gurgel CFD (2018) Exploring the Influence of Temperature on the Reproductive Phenology Aspects of Temperate Seaweeds. Frontiers in Marine Science: Global Change and the Future Ocean, 5: 10.3389/fmars.2018.00218. [pdf]. 127. Pan Y, Wernberg T, de Bettignies T, Holmer M, Li K, Wu J, Lin F, Yu Y, Xu J, Zhou C, Huang Z, Xiao X (2018) Screening of seaweeds in the East China Sea as potential bio-monitors of heavy metals. Environmental Science and Pollution Research, 25: 16640–16651. [doi.org/10.1007/s11356-018-1612-3] [pdf]. 126. Filbee-Dexter K, Wernberg T, Ramirez-Llodra E, Norderhaug KM, Pedersen MF (2018) Movement of pulsed resource subsidies from kelp forests to deep fjords. Oecologia, 187: 291-304. [doi.org/10.1007/s00442-018-4121-7] [pdf]. 125. Kotta J, Wernberg T, Jänes H, Kotta I, Nurkse K, Pärnoja M, Orav-Kotta H (2018) Novel crab predator causes marine ecosystem regime shift. Scientific Reports, 8: 4956. [doi:10.1038/s41598-018-23282-w] [pdf]. 124. Oliver ECJ, Donat MG, Burrows MT, Moore PJ, Smale DA, Alexander LV, Benthuysen JA, Feng M, Gupta AS, Hobday AJ, Holbrook NJ, Perkins-Kirkpatrick SE, Scannell HA, Straub SC, Wernberg T (2018) Longer and more frequent marine heatwaves over the past century. Nature Communications, 9: 1234. [doi:10.1038/s41467-018-03732-9] [pdf, pdf SOM]. 123. Tuckett CA, Wernberg T (2018) High latitude corals tolerate severe cold spell. Frontiers in Marine Science: Coral Reef Research, 5: 10.3389/fmars.2018.00014. [pdf]. 122. Wernberg T, Coleman MA, Bennett S, Thomsen MS, Tuya F, Kelaher BP (2018) Genetic diversity and kelp forest vulnerability to climatic stress. Scientific Reports, 8: 1851. [doi:10.1038/s41598-018-20009-9] [pdf, pdf SOM]. 121. Thomsen MS, Altieri A, Angelini C, Bishop M, Gribben P, Lear G, He Q, Schiel D, Silliman B, South P, Watson D, Wernberg T, Zotz G (2018) Secondary Foundation Species Enhance Biodiversity. Nature Ecology & Evolution, 2: 634–639. [doi:10.1038/s41559-018-0487-5] [pdf]. 120. Filbee-Dexter K, Wernberg T (2018) Rise of turfs: a new battle front of globally declining kelp forests. BioScience, 168(2): 64-76. [doi: 10.1093/biosci/bix147] [pdf]. 119. Bonebrake TC, Brown CJ, Bell JD, Blanchard JL, Chauvenet A, Champion C, Chen I-C, Clark TD, Colwell RK, Danielsen F, Dell AI, Donelson JM, Evengård B, Ferrier S, Frusher S, Garcia RA, Griffis RB, Hobday AJ, Jarzyna MA, Lee E, Lenoir J, Linnetved H, Martin VY, McCormack PC, McDonald J, McDonald-Madden E, Mitchell N, Mustonen T, Pandolfi JM, Pettorelli N, Possingham H, Pulsifer P, Reynolds M, Scheffers BR, Sorte CJB, Strugnell JM, Tuanmu M-N, Twiname S, Vergés A, Villanueva C, Wapstra E, Wernberg T, Pecl GT (2018) Managing consequences of climate-driven species redistribution requires integration of ecology, conservation and social science. Biological Reviews, 93(1): 284-305. [doi: 10.1111/brv.12344] [pdf] [citations]. 118. Franco JN, Wernberg T, Bertocci I, Jacinto D, Maranhão P, Pereira T, Martinez B, Arenas F, Sousa-Pinto I, Tuya F (2017) Modulation of different kelp life stages by herbivory: compensatory growth versus population decimation. Marine Biology, 164: in press 5/7/17. [doi: 10.1007/s00227-017-3196-8] [pdf] [citations]. 117. 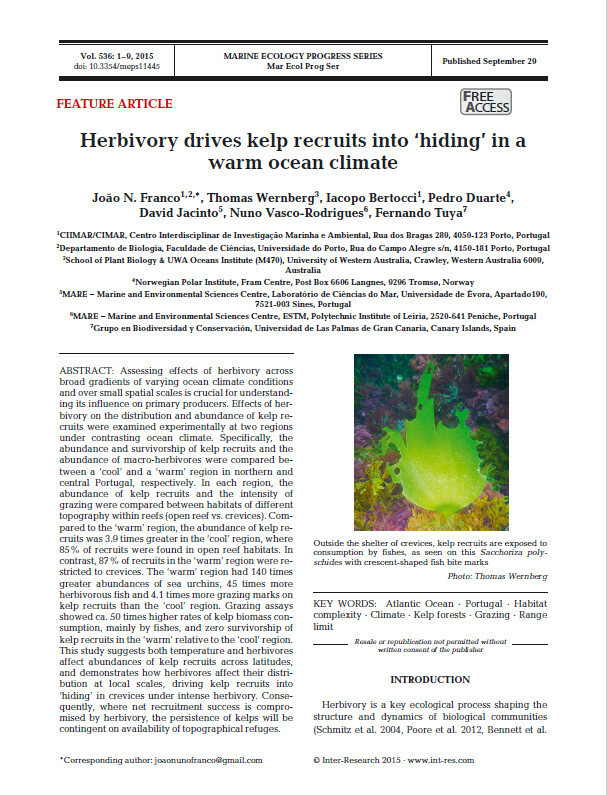 Bennett S, Wernberg T, de Bettignies T (2017) Bubble curtains: herbivore exclusion devices for ecology and restoration of marine ecosystems? Frontiers in Marine Science: Marine Ecosystem Ecology, 4: 302. [doi: 10.3389/fmars.2017.00302] [pdf]. 116. Coleman MA, Wernberg T (2017) Forgotten underwater forests: the key role of fucoids on Australian temperate reefs. Ecology and Evolution, 7: 8406-8418. [doi: 10.1002/ece3.3279] [pfd]. 115. Tuckett CA, de Bettignies T, Fromont J, Wernberg T (2017) Expansion of corals on temperate reefs: direct and indirect effects of marine heatwaves. Coral Reefs, 36: 947–956. [doi: 10.1007/s00338-017-1586-5] [pdf] [citations]. 114. Simpson TJS, Smale DA, McDonald JI, Wernberg T (2017) Large scale variability in the structure of sessile invertebrate assemblages in artificial habitats reveals the importance of local-scale processes. Journal of Experimental Marine Biology & Ecology, 494, 10-19. [doi: 10.1016/j.jembe.2017.05.003] [pdf] [citations]. 113. Zarco-Perello S, Wernberg T, Langlois T, Vanderklift MA (2017) Tropicalization strengthens consumer pressure on habitat-forming seaweeds. Scientific Reports, 7: 820. [doi: 10.1038/s41598-017-00991-2] [pdf] [citations]. 112. van Hees DH, Olsen YS, Wernberg T, Van Alstyne K, Kendrick GA (2017) Phenolic concentrations of brown seaweeds and relationships to nearshore environmental gradients in Western Australia. Marine Biology, 164: 74. [doi: 10.1007/s00227-017-3115-z] [pdf] [citations]. 111. Smale DA, Wernberg T, Vanderklift MA (2017) Regional-scale variability in the response of benthic macroinvertebrate assemblages to a marine heatwave. Marine Ecology Progress Series, 568: 17-30. [doi: 10.3354/meps12080] [pdf, SOM] [citations]. 109. Schlegel RW, Oliver ECJ, Wernberg T, Smit AJ (2017) Nearshore and offshore co-occurrence of marine heatwaves and cold-spells. Progress in Oceanography, 151: 189-205. [doi: 10.1016/j.pocean.2017.01.004] [pdf] [citations]. 107. Wernberg T, de Bettignies T, Bijo AJ, Finnegan P (2016) Physiological responses of habitat-forming seaweeds to increasing temperatures. Limnology and Oceanography, 61(6): 2180-2190. [doi: 10.1002/lno.10362] [pdf] [citations]. 106. Hyndes GA, Heck Jr KL, Harvey ES, Kendrick GA, Lavery PS, McMahon K, Orth R, Pearce A, Vanderklift MA, Vergés A, Wernberg T, Whiting S, Wilson S (2016) Accelerating tropicalization and the transformation of temperate seagrass meadows. BioScience, 66(11): 938- 948. [doi: 10.1093/biosci/biw111] [pdf] [citations]. 104. Boo GH, Le Gall L, Miller KA, Freshwater DW, Wernberg T, Terada R, Yoon KJ, Boo SM (2016) A novel phylogeny of the Gelidiales (Rhodophyta) based on five genes including the nuclear CesA, with descriptions of Orthogonacladia gen. nov. and Orthogonacladiaceae fam. nov. Molecular Phylogenetics and Evolution, 101: 359-372. [doi: 10.1016/j.ympev.2016.05.018] [pdf] [citations]. 103. Simpson TJ, Wernberg T, McDonald J (2016) Distribution and localised effects of the invasive ascidian Didemnum perlucidum (Monniot 1983) in an urban estuary. PLoS One, 11(5) e0154201. [doi:10.1371/journal.pone.0154201] [pdf] [citations]. 102. Thomsen MS, Wernberg T, South PM, Schiel DR (2016) To include or not to include (the invader in community analysis), that is the question. Biological Invasions, 18(6): 1515-1521. [doi: 10.1007/s10530-016-1102-9] [pdf] [citations]. 99. Pinho, D., Bertocci, I., Arenas, F., Franco, J., Jacinto, D., Castro, J., Vieira, R., Sousa Pinto, I., Wernberg, T. & Tuya, F. (2016) Spatial and temporal variation of kelp forests and associated macroalgal assemblages along the Portuguese coast. Marine and Freshwater Research, 67(1): 113-122. [doi: 10.1071/MF14318] [pdf, pdf SOM] [citations]. 98. Bennett S, Wernberg T, Bijo AJ, de Bettignies T, Campbell AH (2015) Central and rear edge populations can be equally vulnerable to warming. Nature Communications, 6:10280. [doi: 10.1038/ncomms10280] [pdf] [pdf SOM] [citations]. 97. Smale DA, Wernberg T, Vance, T (2015) The rise of Laminaria ochroleuca in the western English Channel (UK) and preliminary comparisons with its competitor and assemblage dominant Laminaria hyperborea. Marine Ecology, 36(4): 1033-1044. [doi: 10.1111/maec.12199] [pdf] [citations]. 96. Xiao X, de Bettignies T, Olsen Y, Agusti S, Duarte C, Wernberg T (2015) Sensitivity and acclimation of three canopy-forming seaweeds to UVB radiation and warming. PLoS One, 10(12): e0143031. [doi: 10.1371/journal.pone.0143031] [pdf, pdf SOM] [citations]. 95. Thyrring J, Thomsen MS, Brunbjerg AK, Wernberg T (2015) Diversity and abundance of epibiota on invasive and native estuarine gastropods depend on substratum and salinity. Marine and Freshwater Research, 66(12): 1191-1200. [doi: 10.1071/MF14311] [pdf, pdf SOM] [citations]. 94. Marzinelli EM, Campbell AH, Zozaya Valdes E, Vergés A, Nielsen S, Wernberg T, de Bettignies T, Bennett S, Caporaso JG, Thomas T, Steinberg PD (2015). Continental-scale variation in seaweed host-associated bacterial communities is a function of host condition, not geography. Environmental Microbiology, 17: 4078–4088. [doi: 10.1111/1462-2920.12972] [pdf, pdf SOM] [citations]. 91. Bennett S, Wernberg T, Harvey ES, Santana-Garcon J, Saunders B (2015) Tropical herbivores provide resilience to a climate mediated phase-shift on temperate reefs. Ecology Letters, 18: 714-723. [doi: 10.1111/ele.12450] [pdf, pdf SOM] [citations]. 90. Bennett S, Wernberg T, de Bettignies T, Kendrick GA, Anderson RJ, Bolton JJ, Rodgers K, Shears N, Leclerc J-C, Lévêque L, Davoult D, Christie HC (2015) Canopy interactions and physical stress gradients in subtidal communities. Ecology Letters, 18: 636–645. [doi: 10.1111/ele.12446] [pdf, pdf SOM] [citations]. 89. Rothman MD, Mattio L, Wernberg T, Anderson RJ, Uwai S, Mohring MB, Bolton JJ (2015) A molecular investigation of the genus Ecklonia (Phaeophyceae, Laminariales) with special focus on the Southern Hemisphere. Journal of Phycology, 51(2): 236–246. [doi: 10.1111/jpy.12264] [pdf] [citations]. 88. de Bettignies T, Wernberg T, Lavery PS, Vanderklift MA, Gunson JR, Symonds G, Collier N (2015) Phenological decoupling of mortality from wave forcing in kelp beds. Ecology, 96(3): 850-861. [doi: 10.1890/13-2365.1] [pdf, pdf SOM] [citations]. 87. Thomsen MS, Wernberg T (2015) The devil in the detail: harmful seaweeds are not harmful to everyone. Global Change Biology, 21: 1381-1382. [doi: 10.1111/gcb.12772] [pdf, pdf SOM] [citations]. 86. Bates AE, Bird TJ, Stuart-Smith RJ, Wernberg T, Sunday JM, Barrett N, Edgar G, Frusher S, Hobday AJ, Pecl GT, Smale DA, McCarthy M (2015) Distinguishing geographic range shifts from artefacts of detectability and sampling effort. Diversity and Distributions, 21(1): 13-22. [doi: 10.1111/ddi.12263] [pdf, SOM] [citations]. 85. Bennett S, Wernberg T (2014) Canopy facilitates seaweed recruitment on subtidal temperate reefs. Journal of Ecology, 102 (6): 1462-1470. [doi: 10.1111/1365-2745.12302] [pdf, pdf SOM] [citations]. 84. Mohring MB, Wernberg T, Wright JT, Connell SD, Russell, BD (2014) Biogeographic variation in temperature drives performance of kelp gametophytes during warming. Marine Ecology Progress Series, 513: 85-96. [doi: 10.3354/meps10916] [pdf] [citations]. 82. Smale DA, Wernberg T (2014) Population structure of the purple sea urchin Heliocidaris erythrogramma along a latitudinal gradient in southwest Australia, Journal of the Marine Biological Association of the United Kingdom, 94(5): 1033-1040. [doi:10.1017/S0025315413001604] [pdf] [citations]. 81. Thomsen MS, Wernberg T, Olden JD, Byers JE, Bruno JF, Silliman BR, Schiel DR (2014). Forty years of experiments on aquatic invasive species: are study biases limiting our understanding of impacts? Neobiota, 22: 1-22. [doi: 10.3897/neobiota.22.6224] [pdf] [citations]. 79. Wernberg T, Russell BD, Bradshaw CJA, Gurgel CFD, Thomsen MS, Poloczanska ES, Connell SD (2014) Misconceptions about analyses of Australian seaweed collections. Phycologia, 53(3): 215-220. [doi: 10.2216/13-197.1] [pdf] [citations]. 78. Thomsen MS, Wernberg T (2014) On the generality of cascading habitat formation. Proceedings of the Royal Society B: Biological Sciences, 281(1777):20131994. [doi:10.1098/rspb.2013.1994] [pdf, pdf SOM] [citations]. 77. Andrews S, Bennett S, Wernberg T (2014) Reproductive seasonality and early life temperature sensitivity reflect vulnerability of a range-contracting seaweed. Marine Ecology Progress Series, 495: 419-429. [doi: 10.3354/meps10567] [pdf] [citations]. 76. Thomsen MS, Byers JE, Schiel DR, Bruno JF, Olden JD, Wernberg T, Silliman BR (2014) Impacts of marine invaders on biodiversity depend on trophic position and functional similarity. Marine Ecology Progress Series, 495: 39–47, [doi: 10.3354/meps10566] [pdf] [citations]. 75. Gurgel CFD, Wernberg T, Thomsen MS, Russell BD, Adam P, Waters MJ, Connell SD (2014) Shared patterns of species turnover between seaweeds and seed plants break down at increasing distances from the sea, Ecology and Evolution, 4(1): 27-34. [doi: 10.1002/ece3.893] [pdf] [citations]. 74. Fulton CJ, Depczynski M, Holmes TH, Noble MM, Radford B, Wernberg T, Wilson SK (2014) Sea temperature shapes seasonal fluctuations in seaweed biomass within the Ningaloo coral reef ecosystem. Limnology & Oceanography, 59(1): 156–166. [doi:10.4319/lo.2014.59.01.0156] [pdf] [citations]. 73. Thyrring, J., Thomsen. M.S., Wernberg, T. (2013) Large scale facilitation of a sessile community by an invasive habitat-forming snail. Helgoland Marine Research, 67(4): 789-794, doi: 10.1007/s10152-013-0363-2 [pdf, pdf SOM]. 72. Wernberg, T., Thomsen, M.S., Connell, S.D., Russell, B.D., Waters, J.M., Zuccarello, G.C., Kraft, G.T., Sanderson, C., West, J.A., Gurgel, C.F.D. (2013) The footprint of continental-scale ocean currents on the biogeography of seaweeds, PLoS One, 8: e80168, doi: 10.1371/journal.pone.0080168 [pdf, pdf SOM]. 71. Wernberg, T., Thomsen, M.S. Kotta, J. (2013) Complex plant-herbivore-predator interactions in a brackish water seaweed habitat. Journal of Experimental Marine Biology and Ecology, 449(1), 51-56, doi: 10.1016/j.jembe.2013.08.014 [pdf]. 70. de Bettignies T., Wernberg T., Lavery P., Vanderklift M.A. & Mohring M. (2013) Contrasting mechanisms of dislodgement and erosion contribute to production of kelp detritus. Limnology and Oceanography, 58(5): 1680–1688 [pdf]. 69. Mohring, M.B., Kendrick, G.A., Wernberg, T., Rule, M.J., Vanderklift, M.A. (2013) Environmental influences on kelp performance across the reproductive period: an ecological trade-off between gametophyte survival and growth? PLoS One, 8:e65310 [pdf]. 67. de Bettignies T., Wernberg T. & Lavery P. (2013) Size, not morphology, determines hydrodynamic performance of a kelp during peak flow. Marine Biology, 160:843–851, doi: 10.1007/s00227-012-2138-866 [pdf]. 66. Mohring, M.B., Wernberg, T., Kendrick, G.A. & Rule, M. (2013) Reproductive synchrony in a habitat-forming kelp and its relationship with environmental conditions, Marine Biology, 160: 119-126 [pdf]. 64. de Bettignies T., Thomsen M.S., Wernberg T. (2012) Wounded kelps: patterns and susceptibility to breakage. Aquatic Biology, 17: 223-233 [pdf]. 63. Tuya, F., Cacabelos, E., Duarte, P., Jacinto, D., Castro, J.J., Silva, T., Bertocci, I., Franco, J.N., Arenas, F., Coca, J. & Wernberg, T. (2012) Patterns of landscape and assemblage structure along a latitudinal gradient in ocean climate, Marine Ecology Progress Series, 466: 9-19 [pdf]. 61. Smale, D.A., Wernberg, T. (2012) Short-term in situ warming influences early development of sessile assemblages. Marine Ecology Progress Series, 453:129-136, doi:10.3354/meps09680 [pdf]. 60. Smale, D.A., Wernberg, T. (2012) Ecological observations associated with an anomalous warming event at the Houtman Abrolhos Islands, Western Australia. Coral Reefs, 31:441 [pdf]. 59. Höffle, H., Wernberg, T., Thomsen, M.S., Holmer, M. (2012) Drift algae, an invasive snail and elevated temperature reduces the ecological performance of a warm-temperate seagrass through additive effects, Marine Ecology Progress Series, 450: 67–80 [pdf]. 58. Thomsen, M.S., de Bettignies, T., Wernberg, T., Holmer, M. Debeuf, B. (2012) Harmful algae are not harmful to everyone. Harmful Algae, 16: 74-80 [pdf]. 57. Russell, B.D., Harley, C.D.G., Wernberg, T., Mieszkowska, N., Widdicombe, S., Hall-Spencer, J.M., Connell, S.D. (2012) Predicting ecosystem shifts requires new approaches that integrate the effects of climate change across entire systems. Biology Letters, 8: 164-166 [pdf]. 56. Thomsen, M.S., Wernberg, T., Engelen, A.H., Tuya, F., Vanderklift, M.A., Holmer, M., McGlathery, K.J., Arenas, F., Kotta, J., Silliman, B.R. (2012) A meta-analysis of seaweed impacts on seagrasses: generalities and knowledge gaps, PLoS One, 7: e28595 [pdf]. 55. Wernberg, T., Russell, B.D., Thomsen, M.S., Gurgel, C.F.D., Bradshaw, C.J.A., Poloczanska, E.S., Connell, S.D. (2011) Seaweed communities in retreat from ocean warming. Current Biology, 21: 1828-1832 [pdf, pdf SI]. 54. Tuya, F., Vanderklift, M., Wernberg, T., Thomsen, M.S. (2011) Gradients in abundance explain patterns in the numbers of species at reef-seagrass ecotones, PLoS One, 6(5): e20190 [pdf]. 53. Tuya, F., Wernberg, T. & Thomsen, M.S. (2011) The relative influence of local to regional drivers of variation in reef fishes. Journal of Fish Biology, 79: 217-234 [pdf]. 52. Thomsen, M.S., Olden, J.D., Wernberg, T., Griffin, J.N. & Silliman, B.R.. (2011) A broad framework to organize and compare invasion impacts. Environmental Research, 111: 899-908 [pdf]. 51. Smale, D.A, Wernberg, T. & Vance T. (2011) Community development on subtidal reefs in a biodiversity hotspot: the influences of wave energy and the stochastic recruitment of an ecosystem engineer, Marine Biology, 158: 1757-1766 [pdf]. 50. Thomsen, M.S., Wernberg, T., Olden, J.D., Griffin, J.N., & Silliman, B.R. (2011) A framework to study the context-dependent impacts of marine invasions. Journal of Experimental Marine Biology and Ecology, 400: 322-327. [doi: 10.1016/j.jembe.2011.02.033] [pdf] [citations]. 49. Wernberg, T., Thomsen, M.S., Tuya, F. & Kendrick, G.A. (2011) Biogenic habitat structure of seaweeds change along a latitudinal gradient in ocean temperature. Journal of Experimenal Marine Biology and Ecology, 400: 264-271 [pdf]. 47. Smale, D.A., Wernberg, T., Loyd, P.S., Barnes, D.K.A. (2011) Turning on the heat: ecological responses to simulated warming. PLoS One, 6: e16050 [pdf]. 46. Smale, D.A., Kendrick, G.A. & Wernberg, T. (2011) Subtidal macroalgal richness, diversity and turnover, at multiple spatial scales, along the southwestern Australian coastline. Estuarine Coastal and Shelf Science, 91: 224-231. [doi: 10.1016/j.ecss.2010.10.022] [pdf] [citations]. 45. Wernberg, T., Tuya, F., Thomsen, M.S., Kendrick, G.A. (2010) Turban snails as habitat for foliose algae: contrasting geographical patterns in species richness, Marine and Freshwater Research, 61: 1237–1242. [doi: 10.1071/MF09184] [pdf] [citations]. 44. Waters, J., Wernberg, T., Connell, S.D., Thomsen, M.S., Zuccarello, G.C., Kraft, G.T., Sanderson, J.C., West, J.A. & Gurgel, C.F.D. (2010). Australia’s marine bioregions revisited: back to the future? Austral Ecology, 35, 988–992. [doi: 10.1111/j.1442-9993.2010.02114.x] [pdf] [citations]. 43. Thomsen, M.S., Wernberg, T., Altieri, A., Tuya, F., Gulbransen, D., McGlathery, K., Holmer, M. & Silliman, B.R. (2010) Habitat cascades: the conceptual context and global relevance of facilitation. Integrative and Comparative Biology, 87: 501-509. [doi: 10.1093/icb/icq042] [pdf] [citations]. 42. Thomsen, M.S., Wernberg, T., Tuya, F. & Silliman, B.S. (2010) Ecological performance and possible origin of a ubiquitous but under-studied gastropod. Estuarine Coastal Shelf Science, 87: 501-509. [doi: 10.1016/j.ecss.2010.02.014] [pdf, pdf SOM] [citations]. 41. Wernberg, T., Thomsen, M.S., Tuya, F., Kendrick, G.A., Staehr, P.A. & Toohey, B.D. (2010) Decreasing resilience of kelp beds along a latitudinal temperature gradient: potential implications for a warmer future. Ecology Letters, 13: 685-694. [doi:10.1111/j.1461-0248.2010.01466.x] [pdf, pdf SI] [citations]. 40. Tuya, F., Vanderklift, M.A., Hyndes, G.A, Wernberg, T., Thomsen, M.S. & Hanson, C. (2010) Proximity to reefs alters the balance between positive and negative effects on seagrass fauna. Marine Ecology Progress Series, 405: 175-186. [doi:10.3354/meps08516] [pdf] [citations]. 39. Vanderklift M.A. & Wernberg, T. (2010) Stable isotopes reveal a consistent consumer-diet relationship across hundreds of kilometers. Marine Ecology Progress Series, 403: 53-61. [doi:10.3354/meps08484] [pdf] [citations]. 38. Smale, D.A, Kendrick, G.A., Wernberg, T. (2010) Assemblage turnover and taxonomic sufficiency of subtidal macroalgae at multiple spatial scales. Journal of Experimental Marine Biology and Ecology, 384: 76-86. [doi:10.1016/j.jembe.2009.11.013] [pdf] [citations]. 37. Wernberg, T. & Vanderklift, M.A. (2010) Contribution of temporal and spatial components to morphological variation in a kelp (Ecklonia, Laminariales). Journal of Phycology, 46: 153-161. [doi: 10.1111/j.1529-8817.2009.00772.x] [pdf] [citations]. 36. Tuya, F., Wernberg, T. & Thomsen, M.S. 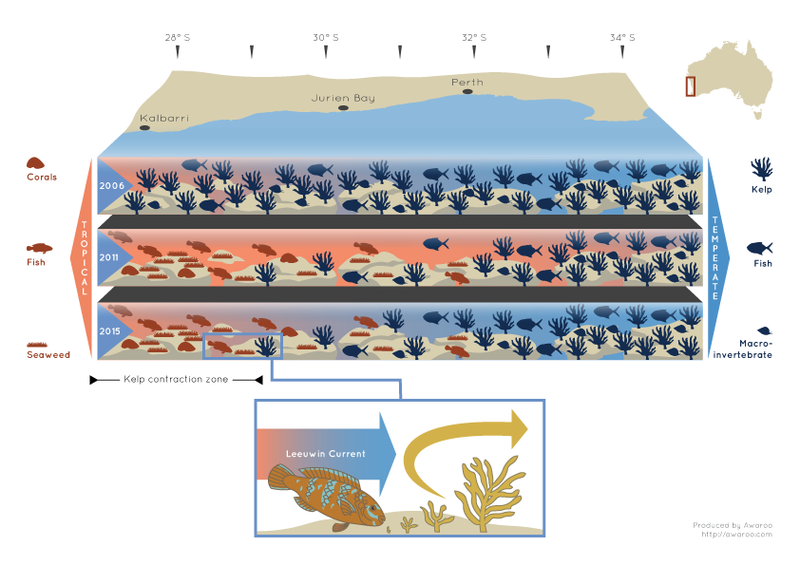 (2009) Habitat structure affect abundances of labrid fishes across temperate reefs in south-western Australia. Environmental Biology of Fishes, 86: 311-319. [doi: 0.1007/s10641-009-9520-5] [pdf] [citations]. 35. Thomsen, M.S., Wernberg, T., Tuya, F. & Silliman, B. (2009) Evidence for impacts of non-indigenous macroalgae: a meta-analysis of experimental field studies. Journal of Phycology, 45(3): 812-819. [doi: 10.1111/j.1529-8817.2009.00709.x] [pdf] [citations]. 34. Smale, D.A. & Wernberg, T. (2009) Satellite-derived SST data as a proxy for water temperature in nearshore benthic ecology. Marine Ecology Progress Series, 387: 27-37. [doi:10.3354/meps08132] [pdf] [citations]. 33. Thomsen, M.S., Wernberg, T., Silliman, B. R., Josefson, A. B. (2009) Broad-scale patterns of abundance of non-indigenous soft-bottom invertebrates in Denmark. Helgoland Marine Research, 63(2): 159-167. [10.1007/s10152-008-0142-7] [pdf] [citations]. 32. Tuya, F., Wernberg, T. & Thomsen, M.S. (2009) Colonization of gastropods on subtidal reefs depends on density in adjacent habitats not on disturbance regime, Journal of Molluscan Studies, 75: 27-33. [doi: 10.1093/mollus/eyn032] [pdf] [citations]. 31. Staehr, P. A. & Wernberg, T. (2009) Physiological responses of Ecklonia radiata (Laminariales) to a latitudinal gradient in ocean temperature. Journal of Phycology, 45(1): 91-99. [doi: 10.1111/j.1529-8817.2008.00635.x] [pdf] [citations]. 30. Wernberg, T. (2009) Spatial variation in population structure of Ecklonia radiata (Laminariales) sporophytes. Aquatic Botany, 90: 93-95. [doi: 10.1016/j.aquabot.2008.05.009] [pdf] [citations]. 29. Tuya, F., Wernberg, T. & Thomsen, M.S. (2008) Testing the ‘abundant centre’ hypothesis on endemic reef fishes in south-western Australia. Marine Ecology Progress Series, 372: 225-230. [doi: 10.3354/meps07718] [pdf] [citations]. 28. Vanderklift, M. A. & Wernberg, T. (2008) Detached kelps from distant sources are a food subsidy for sea urchins. Oecologia, 157: 327-335. [doi: 10.1007/s00442-008-1061-7][pdf] [citations]. 27. Wernberg, T. & Connell, S. D. (2008) Physical disturbance and subtidal habitat structure on open rocky coasts: effects of wave exposure, extent and intensity. Journal of Sea Research, 59: 237-248. [doi:10.1016/j.seares.2008.02.005] [pdf] [citations]. 26. Wernberg, T., White, M. & Vanderklift, M.A. (2008) Population structure of turbinid gastropods on wave-exposed subtidal reefs: effects of density, body size and algae on grazing behaviour. Marine Ecology Progress Series 362: 169–179 [doi: 10.3354/meps07416] [pdf] [citations]. 25. Tuya, F., Wernberg, T. & Thomsen, M.S. (2008) The spatial arrangement of reefs alters the ecological patterns of fauna between interspersed habitats, Estuarine, Coastal and Shelf Science, 78: 774-782. [doi: 10.1016/j.ecss.2008.02.017] [pdf] [citations]. 24. Thomsen, M. S., Wernberg, T., Stæhr, P. A., Silliman, B. R., Josefson, A. B., Krause-Jensen, D., Risgaard-Petersen, N. (2008) Annual changes in abundance of non-indigenous marine benthos on a very large spatial scale. Aquatic Invasions, 3(2): 133-140. [doi: 10.3391/ai.2008.3.2.3] [pdf] [citations]. 23. Wernberg, T. & Goldberg, N. (2008) Species richness and short-term temporal dynamics of foliose algae in a subtidal kelp bed in relation to changes in environmental conditions and canopy biomass. Estuarine, Coastal and Shelf Science 76(2): 265-272. [doi: 10.1016/j.ecss.2007.07.008] [pdf] [citations]. 22. Vanderklift, M. A., How, J., Wernberg, T., MacArthur, L., Heck Jr, K. L. & Valentine, J. F. (2007) Proximity to reef influences the density of small predatory fishes while type of seagrass influences intensity of predation on crabs. Marine Ecology Progress Series, 340: 235-243. [doi:10.3354/meps340235] [pdf] [citations]. 21. Thomsen, M.S., Wernberg, T., Staehr, P.A., Krause-Jensen, D., Risgaard-Petersen, N., Siliman, B. R. (2007) Alien macroalgae in Denmark – a broad-scale perspective. Marine Biology Research 3: 61-72. [doi: 10.1080/17451000701213413] [pdf] [citations]. 20. Wernberg, T., Vanderklift, M.A., How, J. & Lavery, P.S. (2006) Export of detached algae from reefs to adjacent seagrass beds. Oecologia, 147: 692-701. [doi: 10.1007/s00442-005-0318-7] [pdf] [citations]. 19. Wernberg, T. (2006) Scale of impact determines early post-disturbance assemblage structure in subtidal Fucus beds in the Baltic Sea (Bornholm, Denmark). European Journal of Phycology, 41: 105-113. [doi: 10.1080/09670260500505524] [pdf] [citations]. 18. Thomsen, M., Wernberg, T., Stæhr, P. & Pedersen, M. (2006). Spatio-temporal distribution patterns of the invasive macroalga Sargassum muticum within a Danish Sargassum-bed. Helgoland Marine Research, 60: 50-58. [doi: 10.1007/s10152-005-0016-1] [pdf] [citations]. 17. Fowler-Walker, M., Wernberg, T. & Connell, S. D. (2006) Differences in kelp morphology between wave sheltered and exposed localities: morphologically plastic or fixed traits? Marine Biology, 148: 755-767. [doi: 10.1007/s00227-005-0125-z] [pdf] [citations]. 16. Wernberg, T. (2005) Holdfast aggregation in relation to morphology, age, attachment and drag for the kelp Ecklonia radiata. Aquatic Botany 82: 168-180. [doi: 10.1016/j.aquabot.2005.04.003] [pdf] [citations]. 15. Thomsen, M. S. & Wernberg, T. (2005) Mini review: what affects the forces required to break or dislodge macroalgae? European Journal of Phycology 40: 139-148. [doi: 10.1080/09670260500123591] [pdf] [citations]. 14. Wernberg, T. & Thomsen, M. S. (2005) The effect of wave exposure on the morphology of Ecklonia radiata. Aquatic Botany 83: 61-70. [doi: 10.1016/j.aquabot.2005.05.007] [pdf] [citations]. 13. Pedersen, M., Stæhr, P., Wernberg, T. & Thomsen, M. (2005) Biomass dynamics of invasive Sargassum muticum and indigenous Halidrys siliquosa, in Limfjorden, Denmark – implications for invasion effects on ecosystem functioning. Aquatic Botany 83: 31-47. [doi: 10.1016/j.aquabot.2005.05.004] [pdf] [citations]. 12. Wernberg, T., Kendrick, G. A. & Toohey, B. D. (2005) Modification of the physical environment by an Ecklonia radiata (Laminariales) canopy and its implications to associated foliose algae. Aquatic Ecology, 39: 419-430. [doi: 10.1007/s10452-005-9009-z] [pdf] [citations]. 11. Thomsen, M., Krause-Jensen, D., Wernberg, T., Stæhr, P. & Risgaard-Petersen, N. (2005) Alien seaweeds in Denmark: Where? When? How many? (in Danish). Urt 29: 110-115. [pdf] [citations]. 10. Toohey, B. D., Kendrick, G. A., Wernberg, T., Phillips, J.; Malkin, S. & Prince, J. (2004) The effects of light and thallus scour from Ecklonia radiata canopy on an associated foliose algal assemblage: the importance of photoacclimation. Marine Biology 144:1019-1027. [doi: 10.1007/s00227-003-1267-5] [pdf] [citations]. 9. Thomsen, M. S., Wernberg, T. & Kendrick, G. A. (2004) The effect of thallus size, life stage, aggregation, wave exposure and substrate conditions on the forces required to break or dislodge the small kelp Ecklonia radiata. Botanica Marina 47: 454-460. [doi: 10.1515/BOT.2004.068] [pdf] [citations]. 8. Wernberg, T., Thomsen, M. S., Stæhr, P. & Pedersen, M. F. (2004) Epibiota communities on the introduced and indigenous macroalgal relatives Sargassum muticum and Halidrys siliquosa in Limfjorden (Denmark). Helgoland Marine Research 58:154-161. [doi: 10.1007/s10152-004-0180-8] [pdf] [citations]. 7. Kendrick, G. A.; Harvey, E., Wernberg, T., Harman, N. & Goldberg, N. (2004) The role of disturbance in maintaining diversity of benthic macroalgal assemblages from Southwestern Australia. The Japanese Journal of Phycology (Suppl) 52:5-9. [pdf] [citations]. 6. Wernberg, T., Kendrick, G. A. & Phillips, J. (2003) Regional differences in kelp-associated algal assemblages found on temperate limestone reefs in southwestern Australia. Diversity and Distributions 9:427-441. [doi: 10.1046/j.1472-4642.2003.00048.x] [pdf] [citations]. 5. Wernberg, T., Coleman, M., Fairhead, A., Miller, S. & Thomsen, M. S. (2003) Morphology of Ecklonia radiata (C. Ag.) J. Agardh along its geographic distribution in southwestern Australia and Australasia. Marine Biology 143:47-55. [doi: 10.1007/s00227-003-1069-9] [pdf] [citations]. 4. Wernberg, T., Thomsen, M. S., Stæhr, P. A. & Pedersen, M. F. (2001) Comparative phenology of Sargassum muticum and Halidrys siliquosa (Phaeophyceae: Fucales) in Limfjorden, Denmark. Botanica Marina 44:31-39. [doi: 10.1515/BOT.2001.005] [pdf] [citations]. 3. Stæhr, P., Pedersen, M. F., Thomsen, M., Wernberg, T., & Jensen, D. K. (2000) Invasion of Sargassum muticum in Limfjorden (Denmark) and its possible impact on the indigenous macroalgal community. Marine Ecology Progress Series 207:79-88. [doi:10.3354/meps207079] [pdf] [citations]. 2. Wernberg-Møller, T., Thomsen, M. & Stæhr, P. (1998) Invasion of Japweed in Denmark – status anno 1998 (in Danish). Urt 22(4):128-132. 1. Hansen B, Wernberg-Møller T, & Wittrup L (1997) Particle grazing efficiency and specific growth efficiency of the Rotifer Brachionus plicatilis (Muller). Journal of Experimental Marine Biology and Ecology, 215:217-233. [doi: 10.1016/S0022-0981(97)00053-1] [pdf] [citations]. 10. Connell SD, Verges A, Nagelkerken I, Russell BD, Shears N, Wernberg T, Coleman MA (in press). The past and future ecologies of Australasian kelp forests. In ‘Interactions in the Marine Benthos’ (Chapter 16). Eds. Hawkins, S.J., Bohn, K., Firth. L. and G. Williams. Cambridge University Press. Accepted 05.02.18. 8. Straub SC, Thomsen MS & Wernberg T (2016) The dynamic biogeography of the Anthropocene: the speed of recent range-shifts in seaweeds. In: Seaweed phylogeography (eds Hu Z-M & Fraser CI); Springer, ISBN 978-94-017-7532-8, pp. 63-93. [doi: 10.1007/978-94-017-7534-2_3] [citations] [pdf]. 7. Thomsen MS, Wernberg T, South P & Schiel D (2016) Non-native seaweeds changes biogeography and ecology of marine coastal communities. In: Seaweed phylogeography (eds Hu Z-M & Fraser CI); Springer, ISBN 978-94-017-7532-8, pp. 147-185. [doi: 10.1007/978-94-017-7534-2_6] [citations] [pdf]. 3. Wernberg, T., Russell, B.D., Thomsen, M.S. & Connell, S.D. (2014) Marine biodiversity and climate change. In: Freedman B. (ed.) Global Environmental Change, Handbook of Global Environmental Pollution, Vol. 1. Springer-Verlag Berlin Heidelberg, Germany. ISBN 9789400757844, pp. 181 – 187. doi: 10.1007/978-94-007-5784-4_80 [pdf]. 2. Wernberg T, Smale DA, Verges A, Campbell A, Russell BD, Coleman MA, Ling SD, Steinberg PD, Johnson CR, Kendrick GA & Connell SD (2012) Macroalgae and Temperate Rocky Reefs. In: Poloczanska ES, Hobday AJ & Richardson, AJ (eds) A Marine Climate Change Impacts and Adaptation Report Card for Australia 2012. www.oceanclimatechange.org.au [pdf]. 25. Smale DA, Wernberg T (2019) Suffering in the heat: The rise in marine heatwaves is harming ocean species. The Conversation 5/3/19. 24. Layton C, Coleman MA, Marzinelli EM, Steinberg PD, Swearer SE, Vergés A, Wernberg T & Johnson CR (2019). Restoring kelp haibtat in Australia. In. McLeod I.M., Boström-Einarsson L., Johnson C.R., Kendrick G., Layton C., Rogers A.A., Statton J. (2018). The role of restoration inconserving matters of national environmental significance. Report to the National Environmental Science Programme, Marine Biodiversity Hub. Pp. 42-56. 23. Wernberg T, Filbee-Dexter, K (2018) Opinion: Part of our ocean is dying. The WorldPost: Berggruen Institute & The Washington Post 23/10/18 [pdf]. 22. Oliver E, Hobday A, Smale D, Holbrook N, Wernberg T (2018) Marine heatwaves are getting hotter, lasting longer and doing more damage. The Conversation 30/5/18. 21. Vergés A, Steinberg PS, Wernberg T (2016) Underwater health check shows kelp forests are declining around the world. The Conversation 15/11/16. 20. Bennett S, Santana-Garcon J, Wernberg T (2016) A marine heatwave has wiped out a swathe of WA’s undersea kelp forest. The Conversation 8/7/16. 19. Wernberg T, Bennett S, Andrews S (2016) The demise of kelp forests in Western Australia. Released 7/7/16 on YouTube. 18. Gross EM, Wernberg T, Terrados J (2016) What is a plant? and what is Aquatic Botany? Aquatic Botany 132: iii-iv. Editorial. [doi:10.1016/S0304-3770(16)30052-3] pdf]. 17. Wernberg T (2016) Celebrating 25 years of temperate reef science. Marine and Freshwater Research, 67, i-viii. Introduction to special issue. [doi: 10.1071/MFv67n1_ED] [pdf]. 16. Bennett S, Wernberg T, Andrews S (2016). Introducing Australia’s Great Southern Reef. Released 16/1/16 on YouTube. 15. Vergés A, Wernberg T (2015) Climate change: underwater forest decline – loss of kelp forest places commercial fisheries at risk. HOT TOPICS in Ecology, Ecological Society of Australia. 14. Wernberg T, Hobday A, Johnson C, Poloczanska E, Bennett S, Connell S (2015) Australia’s ‘other reef’ is worth more than $10 billion per year – have you heard of it? The Conversation 17/8/15 [pdf]. 13. Wernberg T, Smale DA (2015) Marine heatwaves threaten underwater forests. The Conversation 6/2/15 [pdf]. 12. Poloczanska E, Byrne M, Cantin N, Chin A, Clarke JM, Creighton C, Edyvane K, Fabricius K, Fulton B, Hobbs J-P, Hobday A, Lough J, Parsons M, Pecl G, Salas AR, Rissik D, Salgado CK, Schoeman D, van Oppen M, Wernberg T (2014) National Marine Science Plan, White paper submissions for Biodiversity Conservation and Ecosystem Health: Climate Change Impacts, pp. 1-19 [pdf]. 11. Kendrick GA, Althaus F, Bishop M, Brooke B, Butler I, Caley J, Coleman R, Connell SD, Edyvane K, Ferrari R, Ierodiaconou D, Miller K, Nichol S, Oliver J, Post A, Przeslawski R, Schlacher T, Sinclair E, Stark J, Steinberg P, Tanner J, Verges A, Wernberg T, Whalan S, Williams A (2014) National Marine Science Plan, White paper submissions for Biodiversity Conservation and Ecosystem Health: Benthic Ecosystems, pp. 1-19 [pdf]. 10. 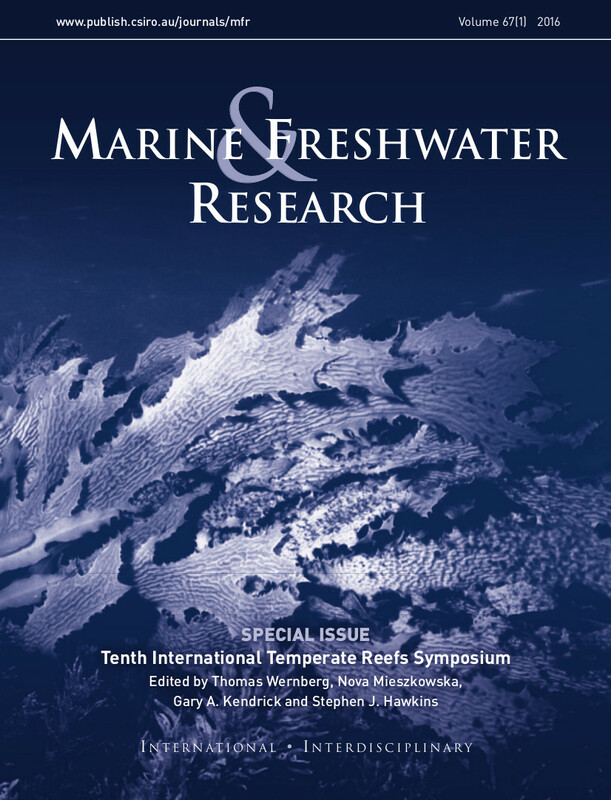 Bennett S., Wernberg T., de Bettignies T. (2014) 10th international temperate reefs symposium: abstract book. The University of Western Australia [pdf]. 8. Lowe, R., Douglas, K., Depczynski, M., et al., incl. Wernberg, T. (2011) Stressed Ecosystems: better decision for Australia’s Future (breakout group C – Ningaloo Reef). Theo Murphy Think Tank Report to the Australian Academy of Sciences. 7. Fulton, C., Depczynski, M., Holmes, T., Radford, B., Wernberg, T. & Wilson, S. (2011) Seasonal and spatial change in Ningaloo Reef seaweed communities. Synthesis Report to the Western Australian Marine Science Institution, Perth, 7 pp. 6. Thomsen, M.S. & Wernberg, T. (2009) Drift algae, invasive snails and seagrass health in the Swan River: patterns, impacts and linkages. Report prepared for the Swan River Trust. Report no. 2009-2 from the Centre for Marine Ecosystems Research, Edith Cowan University, Perth. Pp. 82. 5. Poloczanska, E.S., Johnson C., Wernberg, T. (2008) Approaches for Predicting Marine Climate Change. In Poloczanska, E. S., Hobday, A. J. and Richardson, A. J. (eds) ‘In Hot Water: preparing for climate change in Australia’s coastal and marine systems’, Workshop conveners report – proceedings of conference held in Brisbane, 12-14th November 2007, CSIRO Marine and Atmospheric Research, Hobart, Tasmania, Australia. 4. Wernberg, T., Thomsen, M.S. & McMahon, K. (2008) Determining seagrass depth distribution in the Swan River – a test of the dumpy level method with recommendations for alternatives. Report prepared for the Water Science Branch, Department of Water. Report no 2008-2 from the Centre for Marine Ecosystems Research, Edith Cowan University, Perth. Pp. 22. 3. Thomsen, M.S., Staehr, P.A., Wernberg, T., Krause-Jensen, D. & Josefson, A. B., Tendal, O.S. (2008) Introduced plants and animals Denmark (in Danish). Naturens Verden, 6: 10-18 (popular science journal). 2. Thomsen, M. S., Staehr, P. A & Wernberg, T. (eds.) (2007) First Symposium on Marine Bioinvasions in Denmark, Copenhagen August 17 2007: Abstract book with introduction and summary. Pp. 24. 1. Babcock, R.; Clapin, G.; England, P.; Kleczkowski, M.; Murphy, N.; Phillips, J.; Sampey, A.; Vanderklift, M.; Cook, K.; Stuart-Andrews, C.; Waddington, W. & Wernberg, T. (2006) Chapter 6: Benthic ecosystem dynamics. Strategic Research for the Marine Environment, final report. Commonwealth Scientific and Industrial Research Organisation.